Creamy and delicate, a perfect addition to the holiday table. In a medium pot over medium-high heat, cook the bacon in two batches until crisp. Drain bacon on a paper towel. Remove all but 2 tablespoons of bacon fat from pan. Add onion and garlic. Sauté over medium heat until softened. Add the chicken broth and spinach. Cook for 2 minutes, until spinach is softened. Add half the bacon, remove from heat. In a small pot, combine the corn starch and heavy whipping cream. Cook for 5 minutes, or until thick bubbles form. 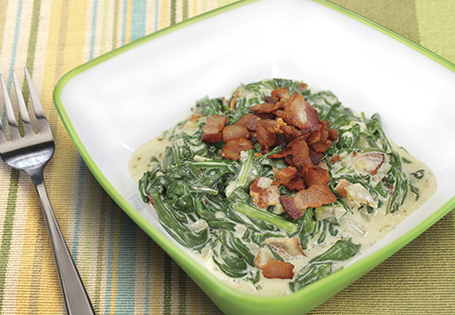 Combine the cream sauce and the spinach mixture, season with salt and pepper to taste. Pour into a serving dish. Top with remaining bacon. TIP: Lighten the calories by using 2% milk in place of the heavy whipping cream and an additional teaspoon of corn starch!